As Unself grew its user research program following our first full study, I worked with the team to capture every touch point we have with users prior to an interview or test session. 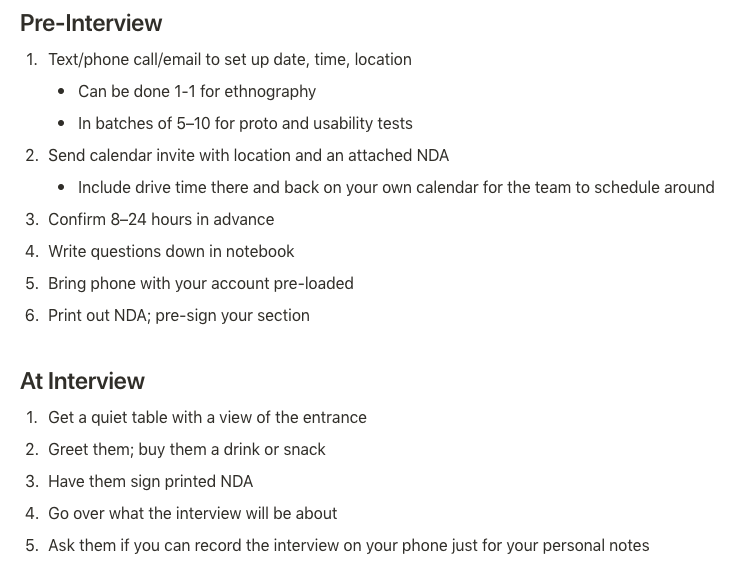 The result of these efforts and analyzing/iterating on my own research process led to this scalable template of our Interview Process. Some of the items were truly born from practice, like our thank you email template and even down to suggestions on where to sit when waiting for a participant. The most valuable parts of this exercise for me were to 1) justify to myself and the team why we would ask certain questions in ethnographic interviews and 2) watch another team mate interview someone after having this toolkit!